Group 17 elements are typical non-metals and also known as halogens. The elements in this group are fluorine. chlorine, bromine, iodine and astatine. In nature, all halogens exist as diatomic molecules. They are written as F2, Cl2, Br2, I2 and As2. Most of the halogens exist in the nature as halide salts. Halide is the name given to the ion of halogens. Table below shows the corresponding halide of the halogen. 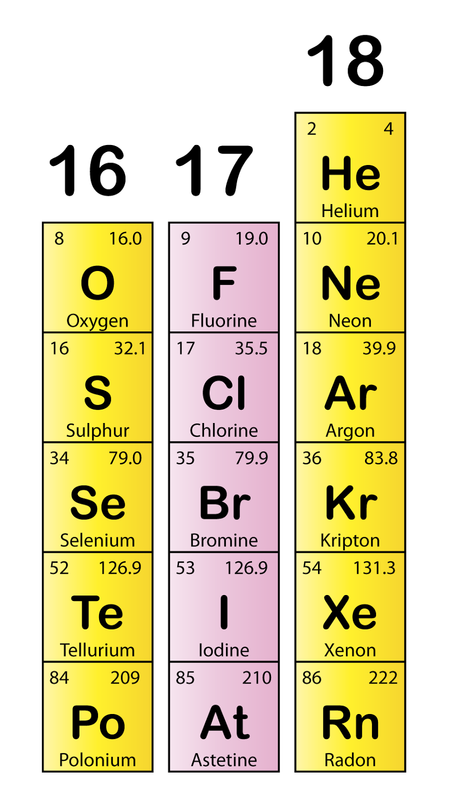 All group 17 elements are non-metals. Therefore they are heat and electricity insulator. Table below shows the electron arrangement and physical properties of group 17 elements. The atomic size of group 17 elements increases down the group. This is due to the increase of number of electron shell down the group. The density of group 17 elements is also increases down the group. This is because the rate of increment of the atomic mass is higher than the rate of increment of the volume. 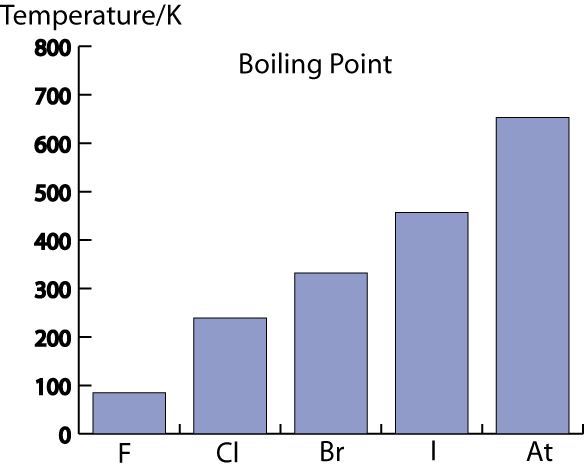 As shown in the graph to the right, the melting points and boiling increase steadily down the group. 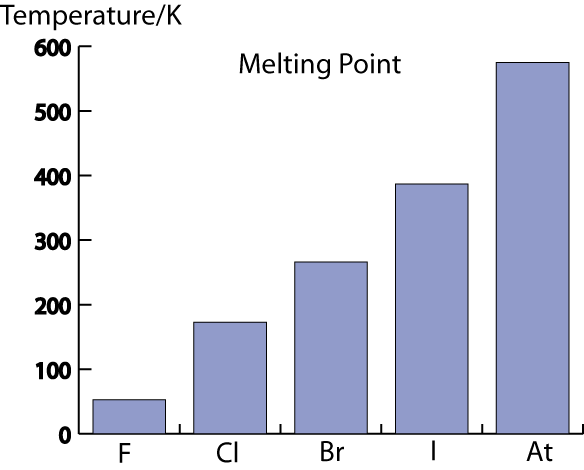 The physical state at room temperature also change from gas to liquid and then to solid. This is because the intermolecular attractive force (van der Waals force) increase with increasing size of atom or molecule. Group 17 elements are very reactive non-metals. The atoms all have 7 valence electrons, makes them have very similar chemical properties. During chemical reaction, the atom gains one electron to form an ion with charge of -1. The reactivity of group 1 decreases down the group. All group 17 elements are poisonous. Fluorine, chlorine and bromine gases are poisonous. Therefore all the experiments involving these gases should be carried out in a fume chamber. The experiments involve fluorine are nor done in school. This is because fluorine is so reactive that it will react with most of the substance it comes into contact with. It is very difficult to conduct experiments involving fluorine. The iron wool burns vogorously with bright flame, forming a brown solid after reaction. Chlorine react with iron to form brown iron(III) chloride. 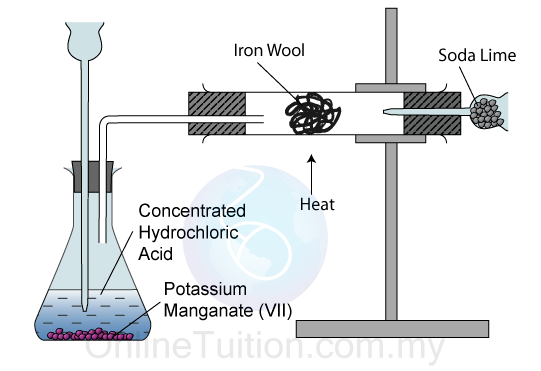 The reaction of potassium with concentrated hydrochloric acid produces chlorine gas. The iron wool glows brightly but less vigorously. A brown solid is formed. Bromine react with iron to form brown iron(III) bromide. The iron wool glows slowly with dim light. A brown solid is formed after reaction. Iodine react with iron to form brown iron(III) iodide. Halogen is a reactive non-metal. It form salt when react with metal. The reactivity decreases down the group. Chlorine gas is a poisonous. Excess chlorine gas is absorbed by the soda lime (sodium hydroxide) so that it does not escape to the surrounding. 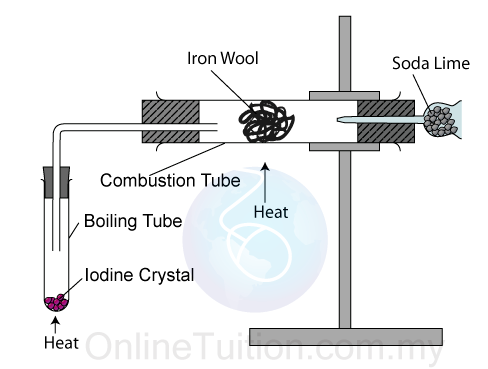 Iron wool rather than iron piece is used to increase the rate of reaction. Chlorine gas dissolves in water to form a pale yellow solution. The solution turn blue litmus paper red before it is bleached. The solution formed is acidic and contains bleaching agent. Hypochlorous(I) acid is a strong bleaching agent. It decolourises the colour of litmus paper. Bromine liquid dissolves slowly in water to form a yellowish-brown solution. The solution turn blue litmus paper red before it is bleached slowly. Hypobromous(I) acid is a weak bleaching agent. Only a little iodine dissolves in water to form a yellowish solution. The solution turn blue litmus paper red but does not bleach it. Hypoiodous(I) acid has very weak bleaching characteristic. Chlorine, bromine and iodine are soluble in water to form an acidic solution. The solubility decreases down the group. Aqueous chlorine and bromine are bleaching agent. Aqueous iodine does not act as bleaching agent. The greenish chlorine gas dissolves quickly in sodium hydroxide, forming a colourless solution. Chlorine gas react with sodium hydroxide to form salt of sodium chloride, sodium chlorate(I) and water. The reddish-brown liquid bromine dissolves in sodium hydroxide, forming a colourless solution. 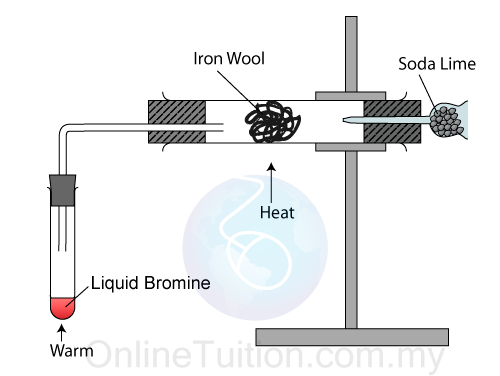 Bromine liquid react with sodium hydroxide to form salt of sodium bromide, sodium bromate(I) and water. The reaction is less reactive compare with chlorine. The black iodine crystals dissolve slowly in sodium hydroxide, forming a colourless solution. Solid iodine react slowly with sodium hydroxide to form salt of sodium iodide, sodium iodate(I) and water. The reaction is least reactive among the three. The reactiveness of halogens decreases down the group. When a halogen atom reacts, it gains an electron to form a singly negative charged ion. As we go down the group from F => Cl => Br => I, the size of the atom increases due to an extra filled electron shell. The valence electrons are further and further from the nucleus, the attraction force between the electrons and the nucleus become weaker and weaker. Therefore the ability of the atom to attract electron to fill the outermost shell reduces., which means the reactiveness of the atom reduces.